Nigeria’s First Lady Aisha Buhari has flown to London to be with her husband, President Buhari, who is on medical leave, according to a News Agency of Nigeria (NAN) report. 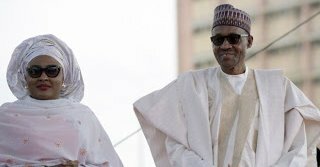 74-year-old Buhari has been in London since 7 May to be treated for an unspecified illness, amid intense speculation that he is seriously ill.
“Her Excellency will spend some time with her husband President Muhammadu Buhari who is presently on medical vacation,” said a statement released by Mrs Buhari’s office. “She (Aisha Buhari) expressed her appreciation to the millions of Nigerians who have been praying for his quick and safe return,” it added.